YPP's Getso summarized it aptly. She said, "in 2015 we had no choice and settled, this 2019 we will have a choice." Choices actually. I have not yet chosen my candidate from the new generation crew, but I have chosen who my candidate shall not be, and that's Atiku Buhari. 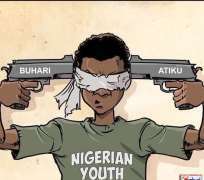 It is shameful that APC and PDP have so far successfully cajoled Nigerian youth into thinking the only option they have is to pick Atiku Buhari. What happened to "Not too young to run?" So many viable youth are running this time and too many youth are still on the expired bandwagon of the geriatric cabal who destroyed Nigeria and have no vision than more destruction on the next level. I feel horrified that youth can either be so forgetful or so wicked to chose and promote Atiku Buhari. Two mass murderers. Have the youth forgotten Odi massacre that Obasanjo and Atiku perpetrated? How dare you support people who killed 2500 innocent Nigerians in Bayelsa? Do you not fear God? And dont' tell me it was Obasanjo and not Atiku. Is Osinbajo not claiming Buhari's "achievements" today as he campaigns for their next term on the joint ticket? Of course Osinbajo is responsible for the Zaria, Onitsha, Benue and other XYZ massacres under team Buhari-Osinbajo. That's the same way Atiku campaigned together with and for ticket Obasanjo-Atiku after the Odi and Zaki Biam massacres. The blood is on all their hands. Does Buhari not romance Obasnajo? Does Atiku not seek his blessings still? Anyone who fears God will run from Obasnajo and his children, Atiku and Buhari. Before even talking about economic stagnation and expired ideas and the way APC and PDP continue to protect the same group of cabal while locking up poor Nigerians in jails for stealing ordinary gari and massacring us; the mass murders and secret burials best pals Atiku and Buhari perpetrate is enough to make it an abomination to ever support them. Diaris God O! Did Atiku not put Buhari in power? Did Buhari not reward him with positions for Atiku's Garba Shehu, and other juicy ministerial spots and send Atiku as his ambassador earlier in the term? Atiku and Buhari are one and the same and even vaguely thinking of these two clueless and wicked, corrupt and clueless folk is to your shame! I expect youth to rise up and walk the streets and sing "Cabal Must Go!" This is our chance. At last we can take Nigeria back. We will force the new generation candidates to settle for a single youth who we will all stand behind as the elections approach. For now join me stand up and shout, "Cabal Must Go!" #IStandToTakeOver. And on a final note, this is not just about the presidency. Please support only new generation candidates and new parties at all levels, senatorial, gubernatorial, representative and chairmanship. We have wasted another 20 years. it is enough! It is time to clean out the colonial expired vultures who chanced our parents and chanced us. It is time for a new story for Nigeria. it is our time.